Samuel John Wyeth was born circa 1849. At the time of Samuel marriage the certificate did not record either the parents or his place of birth and his death certificate shows place of birth and parents as unknown. Samuel came to New Zealand either late 1875 or early 1876. Samuel married Caroline Ann Tremayne on 6 Jun 1877 in The Terrace Wellington. Caroline was born circa 1853. Thomas Henry Wyeth was born circa 1878 in Wellington, New Zealand and died on 1 Aug 1937 at age 59. Samuel John Wyeth was born circa 1880 and died circa 1880 in Wellington, New Zealand. Eliza Ann Wyeth was born circa 1882. Mary Elizabeth Wyeth was born circa 1884. Bessie Wyeth was born 20 Oct 1886, Express Avenue, Wellington City, Wellington, New Zealand d. 06 Jan 1936, Wellington Hospital, Wellington City, Wellington. Ethel Maud Wyeth was born circa 1889 and died on 4 May 1970 in Lower Hutt, Wellington, New Zealand at age 81. Lily Tremaine Wyeth was born circa 1890 and died in 18 May 1904 in Wellington, New Zealand at age 14. Arthur Francis Reidy Wyeth was born on 2 Oct 1901 in Wellington, New Zealand and died on 20 Nov 1937 at age 36. 1910/1915 24 Richmond St, Petone, i.e. some 3 Years after his death. Caroline died in 2 March 1910 in Petone aged 57. Samuel died on 7 June 1912, aged 63, at 28 Aurora Street Petone, his occupation being recorded as Labourer. He died of Chronic Bronchitis and Heart Failure, the cause of death being given by Dr M.W.Ross who had last seen him on 16 April 1912. He was buried on 9 June, at Taita Cemetery, Lower Hutt. At the time of his death his children and their ages were recorded as "Sons - 12,34; Daughters - 19,23,25,27,29." Lina (Dolly) Wyeth was born on 17 July 1908 in Wellington, New Zealand . Lina married Julian Edward Fletcher in 1936 in Wellington. Julian was born on 7 February 1905 the son of Ralph Neild and Letitia (nee Grove) Fletcher. They had 1 son. Julian died in 1979 and Lina on 3 March 1997 aged 88. Florence Wyeth Challenor was born on 2 December 1912 in Petone, New Zealand she died on 13 December 1912 . Amy Maud Wyeth was born on 27 September 1914 in Petone, New Zealand. Amy married Eric Peter Coe in 1939 Eric was born on 21 December 1913. They had 1 son.he Eric died in 1979 and Amy in 1997. Samuel John Wyeth was born on 21 April 1880 and died on 27 October 1880 aged 6 months in Wellington, New Zealand. Eliza Ann Wyeth was born in Wellington on 3 Jan 1882. 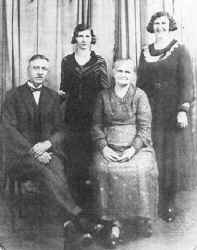 Mary (May) Elizabeth Wyeth was born on 27 June 1884. May was married on 26 April 1911 at St Augustines Church, Petone to Albert Ernest Rouse son of William and Suasan Ann Rouse. Albert died in 1960 and Mary on 12 September 1968. Bessie Wyeth was born on 20 October 1886 in Express Avenue, Wellington City. 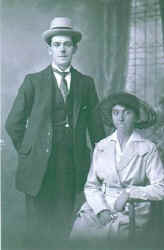 Bessie married Daniel Callaghan on 25 May 1906 in Wellington. Daniel was born circa 1886 in Wellington son of Michael Callaghan and Mary Thomas. Bessie died on 6 January 1936 and Daniel on 19 December 1950. They are buried in Karori Cemetery Wellington. 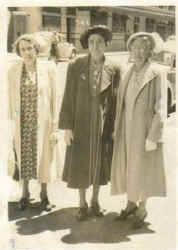 Ethel Maud Wyeth was born on 13 December 1888 and died on 4 May 1970 in Lower Hutt, Wellington, New Zealand at age 81. Ethel did not marry. Lily Tremaine Wyeth was born on 8 October 1890 and died on 18 May 1904 in Wellington aged nearly 14 years. Amy Florence Wyeth was born on 9 March 1894 in Petone. Amy married John Thomas (Jack) Horne on 14 October 1914 in St Augustines Church, Petone. Jack was born on 20 July 1888 in Lincolnshire, England, son of Richard Horn and Elizabeth Lucas. Mervyn Horne was born on 11 December 1924 in New Zealand and died circa 1983 in New Zealand aged 59. Margaret Amy Horne was born on 27 November 1927 in New Zealand and died on 10 March 2007 in Christchurch aged 79. Ronald Horne was born on 27 November 1927 in New Zealand and died circa 1990 in New Zealand aged 63. Jack died circa 1936 in Christchurch, New Zealand at age 48. Amy died 10 October 1968 also in Chrisstchurch. Archives reference BDM 20/22 p312/122. Source Registrar Births, Deaths and Marriages. Marriage entry 1877/857.